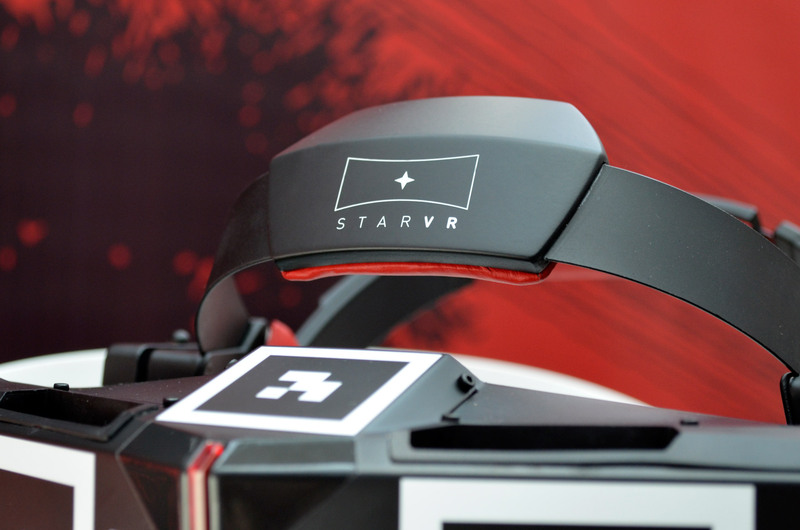 We go hands on with the latest StarVR headset prototype from Starbreeze Studios, sporting a 210 degree field of view and dual quad-HD panels as demoed at E3 with Overkill’s The Walking Dead experience. The InfinitEye team’s metamorphosis from part-time garage hackers to fully fledged VR industry players is a real rags-to-riches technology tale, one which we’ll detail in the near future for you. For now, know that InfinitEye—the 210 degree FOV VR headset—is reborn as StarVR, now part of Swedish developer Starbreeze Studio’s planned assault on the virtual reality entertainment space. 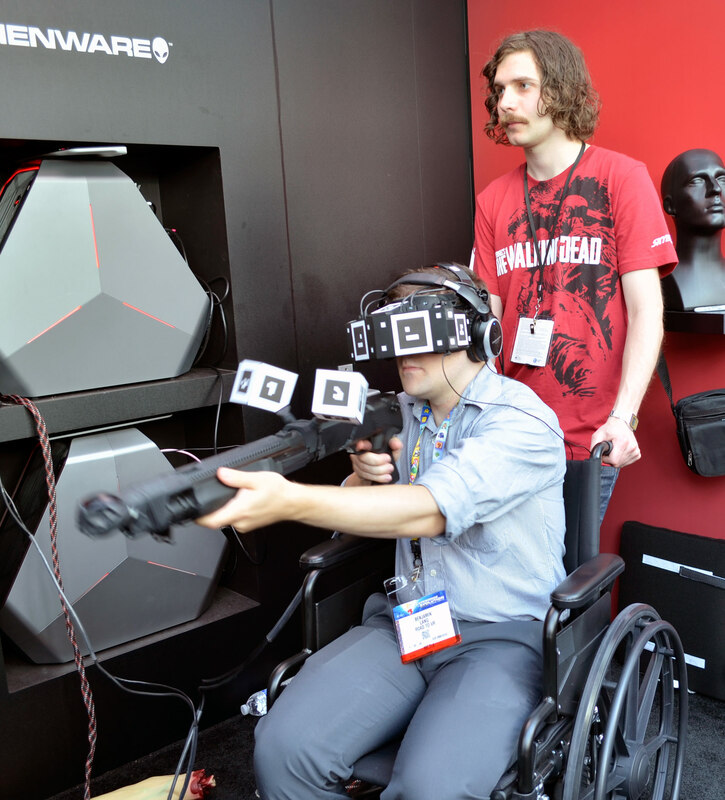 StarVR was launched this week alongside a dedicated made-for-VR experience based on the hugely popular The Walking Dead franchise and available this week at a dedicated stand just inside the LA Convention Center at E3 2015. 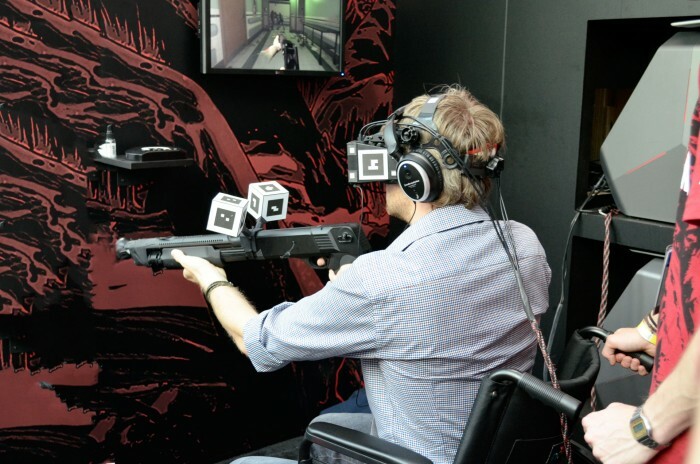 Starbreeze’s cunningly located custom booth houses five demo pods, each comprising a StarVR headset, motion tracked pump-action shotgun, and… a wheelchair(?). You see, Starbreeze’s The Walking Dead VR offering goes the extra mile compared with most other virtual reality experiences present at E3 this year. The team wanted people to feel not only immersed but involved in the action, which means physical props and feedback. Sitting down and donning StarVR and headphones, I’m immediately reminded of what impressed me so much back in 2013 when I visited the InfinitEye team in Toulouse, France. Your peripheral vision is, for all intents and purposes, entirely enveloped in the virtual world. The combination of StarVR’s gargantuan 210 degree horizontal and 135 degree vertical field of view really wraps your brain in a panoramic VR experience. 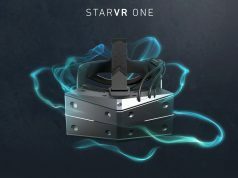 This is StarVR’s killer unique selling point and it’s beyond anything you’ve tried before. StarVR’s other main strength is of course its dual Quad HD panels, which delivers 2560 x 1440 pixels to each eye, that’s a staggering 5k horizontal resolution. The result? No appreciable screendoor effect whatsoever, something that bizarrely takes a little getting used to at first. As the experience began though, some problems did emerge. But, whilst I’ll of course detail them in full, please bear in mind the system’s prototypical status and read through to my conclusion before judging too harshly. Firstly, head tracking is provided by an onboard IMU for rotational tracking and a set of external fiducial markers, tracked by a motion camera mounted nearby, for positional tracking. Positional tracking is 360 degrees in this ‘outside-in’ style system and was chosen by the team for its ease of application for rapid prototyping. The shotgun you’re handed a little way into the experience sports two fiducial marked cubes, ideal for a positionally tracked input device. During our time with the system, the LA sunshine was beaming through the convention centre’s glass atrium and was playing havoc with computer vision. According to the company, this was the cause of some distracting judder in the positional headtracking. Suffice it to say however, this is unlikely to be the tracking system that will feature on the final, consumer headset. The StarVR team are considering all options right now, including the possibility of Valve’s Lighthouse amongst others. In any case, the team are aware of the current system’s deficiencies and are working hard to replace or enhance it as soon as they’re happy they’ve found the right fit. As the action gets underway, the capabilities of Starbreeze’s proprietary game engine, ‘Valhalla’, come to the fore. As you’re wheeled in-game through a dilapidated hospital environment crawling with the undead, the scenery is beautifully lit, with the engine painting a detailed, oppressive environment. The team are proud of Valhalla, claiming its suitability and optimsations make it perfect for virtual reality development. 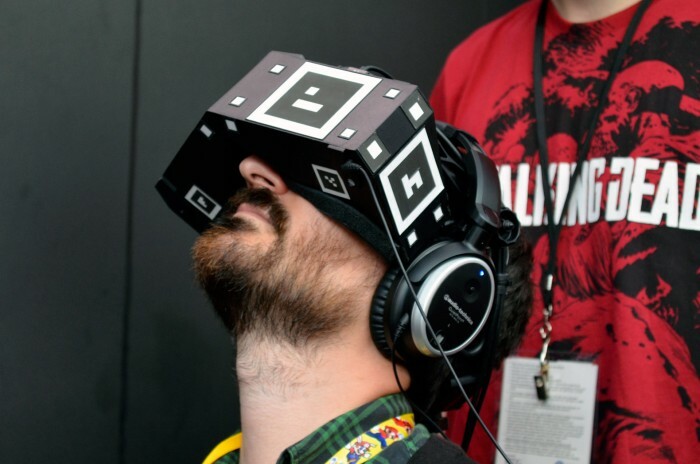 The advantage of an in-house engine is that the hardware and integration teams have low-level access to the engine’s code, which should mean tight hardware and software integration; something not to be sniffed at and something that could give Starbreeze a real edge when it comes to delivering compelling and comfortable content for StarVR. Back to the action… after being handed that shotgun, you get to start meting out zombie death-justice to the ever growing hordes of undead, now coming at you from all angles. A pleasing surprise was that the shotgun, a modified air-soft device with retro-fitted fiducial markers, worked really well. The weapon it turns out was built by input specialists TrinityVR, and had a functional pump action mechanism for reloading. The tactile sensation when reloading, physically aiming the weapon, and then pulling the trigger is hard to beat and added enormously to overall the experience. One aside regarding the Walking Dead experience was an interesting experiment on the team’s part in enhancing presence in a virtual space. Physical interaction turns out to be a subtle touch. During scenes where your wheelchair is being pushed by one of your teammates in the game, one of the demo’s handlers gently shakes the wheelchair to match. As daft as this may sound, it was supremely effective in rooting your physical presence in this virtual world; incredible how such a seemingly asinine interaction like this can trick your brain so well. StarVR’s dual 5.5 inch, quad-HD (1440p) LCD panels run at 60Hz and (as the team will admit) are not ideal. LCD panels are prone to smearing which was in evidence here; without the OLED-enabled low persistence of vision, visuals in motion lacked the silky smooth action we’ve come to expect from VR headsets. Contrast and vibrancy was also lacking, again another artefact of LCD panels. The team tell us this is another aspect they are well aware of and will address, likely with OLED panels in a future iteration. There was also a problem with convergence when in the headset, borne from the current prototype’s fixed IPD and the software set for a global audience (it’s too time consuming to measure and calibrate for everyone’s IPD in such a setting, the team said). This lead to a slightly uncomfortable cross-eyed sensation which you needed to adjust to throughout the demo. Adjustable IPD in software will of course feature in the final headset, though we’re unsure if the team plan to add a physical IPD adjustment. The final quibble comes in the form of head tracking latency. It is perceptible with the current hardware and software stack, albeit certainly not in an offensive manner. Once again however, we’re keeping in mind that this is still early prototype software and hardware, fast pixel switched displays and higher quality IMUs stand to further improve things. After only a few minutes of intense action, I find myself overwhelmed by the zombie masses and my experience is over. After the headset is removed, I have a huge grin on my face. Despite the problems I’ve outlined above, The Walking Dead VR experience powered by StarVR is a hugely immersive and enjoyable time that I’d recommend to anyone. As for the headset, although the issues I’ve listed above may seem numerous, bear in mind that they’re mostly entirely surmountable and known. Low persistence panels and adjustable IPD are becoming industry standards and it’s really only a matter of time until the team implement better components and tweak design to further improve the headset. 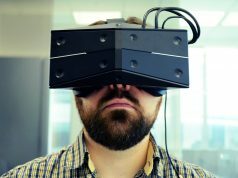 The bottom line is, StarVR is a hugely exciting prospect for anyone not satisfied by what some see as FOV compromises in the forthcoming wave of consumer headsets. Weight on this latest iteration has come down and ergonomics are much improved from what I saw of the very early protoype in 2013. 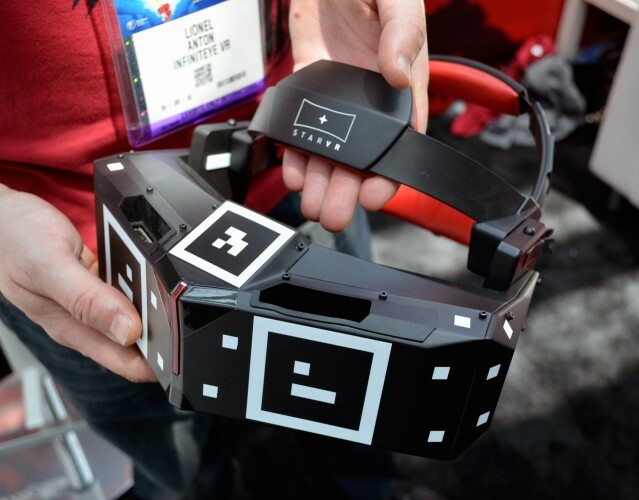 The team continue to rapidly iterate through hardware revisions and by the time E3 2016 rolls around, I suspect StarVR will be a premium headset to aspire to. Starbreeze’s desire to tightly couple both hardware and software is a great approach and with ingenious, creative experiences like The Walking Dead, may offer content which goes beyond what the current generation of headsets will generally offer. As ever, we’ll remain in close contact with the team and bring you experiences of new hardware as it become available. One thing’s for sure though, InfinitEye is dead—long live StarVR. Great article Paul. Looks really interesting! Surely, Oculus and HTC will go for that tech in consumer iteration 2. Aaaand… Valve Lighthouse for full-room position tracking, which in March, Valve indicated that they would like to “give the tech away” in the hopes that it would become a VR standard. Aaaand… Someday I’m sure, one of these VR headset companies will incorporate stereo cameras on the front of the units that will pass through video of the real world. Such combined with Google’s Project Tango environment mapping and the necessary software bits will allow AR functionality a la Microsoft HoloLens. AR and VR applications in one headset seems to be a natural evolution. I am not too sure how eye tracking will help. If the display cannot update fast enough for regular head tracking, then how could it possibly be faster for tracking eye movement. This is a point that many people overlook with ‘foveated’ rendering. It looks good on paper, but make it work. Mmmmm. Having that wide of a FOV must make the picture blurry I would imagine, but the concept is sound.